The A. James Clark School of Engineering profiles five ISR professors and an additional professor from the Electrical and Computer Engineering Department in its new issue of E@M magazine. 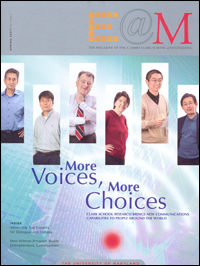 The story, titled "More Voices, More Choices," highlights research that is moving the wireless world forward in speed, access, connectivity, quality, security, and complexity. Featured are Professors Tony Ephremides (ECE/ISR), K.J. Ray Liu (ECE/ISR) and Prakash Narayan (ECE/ISR); and Associate Professors Sennur Ulukus (ECE/ISR) and Richard La (ECE/ISR). Also part of the group is ECE Associate Professor Gang Qu.